In September’s post, we discussed compassion resilience, or CR, and how to move from compassion fatigue toward wellness. We also discussed the 7 C’s of CR that we can apply in our work with others to ourselves. Review them here. So far, we’ve talked a lot about what CR is and why it’s so important in maintaining your personal well-being and job satisfaction. In this post, we will discuss 6 tips that will help you set compassionate boundaries. 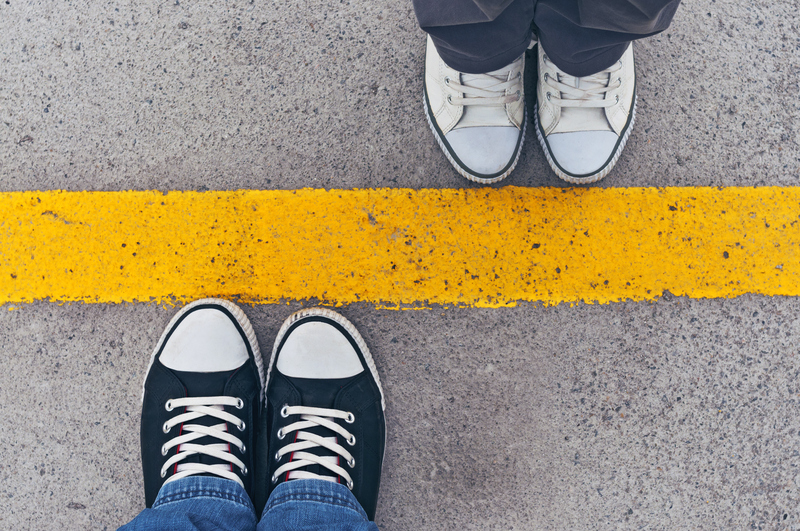 This may seem awkward or difficult to do, but establishing these boundaries will allow you to do your best work in the future and establish healthy relationships with the people you serve, co-workers, family, and friends. What do we mean by setting compassionate boundaries? Typically people think of setting boundaries as being all about what to say “no” to in order to protect ourselves. We focus on words such as declining and refusing. We are trying to avoid feeling frustration, anger, hurt, resentment, or disrespected. While this is part of the concept, we believe that a more positive and proactive approach is actually more effective and compassionate. We start with the question, when you think of the person you want to be on the job, in your friendships, etc., what are the behaviors you want to demonstrate? Once you know that list of behaviors, you can identify the boundaries that you want to set in your relationships that will support you being the person you want to be. Here’s an example: On the job you want to be a person that your co-workers can turn to for assistance when needed. You also want to maintain a pleasant attitude. In order to be both pleasant and available to your co-workers (and get your tasks done! ), you would appreciate some notice ahead of time to when your help might be needed. That is a boundary conversation that you can have with your co-workers. Later we will look at what you might say. While it may be difficult in the short term to set boundaries at home or at work, not doing so may lead to many more problems in the long term. What may indicate that we are not setting compassionate boundaries? Remember Gentry’s “zealot” stage of compassion fatigue, where people say “yes” to each and every opportunity but quickly can move to the “irritability” stage When we do not identify, set, and maintain compassionate boundaries, we may say yes when we really mean no. We may make other people’s problems our priorities, perhaps to the exclusion of our own needs. Not setting boundaries may also be evident when we accept abuse or unfair treatment. We may also become overly apologetic and not speak what we are truly feeling. In short, a lack of boundaries may be a catalyst for compassion fatigue. In contrast, setting healthy boundaries is a way to stand up for our values and maintain both our self-respect and our respect for others. It is a way to prevent and limit our annoyance, frustration, and anger AND increase the likelihood of behaving in the ways that we desire. As Brené Brown says in her book, Daring Greatly, setting very clear boundaries about what we are willing to do, unwilling to do, willing to take on, and unwilling to take on, is an integral part of being compassionate. In the process of developing CR, we must, therefore, learn how and when to apply compassionate boundaries, as well as when to relax or let go of our boundaries. Know what you want to say “yes” to according to your own priorities and values. Take the time to judge whether a particular action or interaction may lead to us feeling caring and competent or hurt, overwhelmed, stressed, or angry. It may help to tune into your body and notice physical sensations. If you feel a boundary has been crossed, what physical sensations do you experience? Only once you are aware of your own feelings and needs can you take conscious action about how to communicate with the other person. If you can’t or don’t want to participate, remember that saying “no” is perfectly okay. Many people, especially women, have developed beliefs that we must be pleasing, agreeable, helpful and nice to earn love and appreciation. Taken to the extreme, this belief can make us “give to get” and feel uncomfortable saying no to requests for help. Click here for some additional tips on how to say “no” with compassion. If you feel that your boundaries are being crossed, respectfully tell that to whoever is crossing them. Tell them how you wish to be treated or state what you are or are not willing to do in words that describe what you value and desire for yourself and your relationships. Reinforce your point by pointing out past violations or near-violations. This will give them specific context and decrease the chances of it happening again. If you think someone will violate your request/wishes, also state the consequence, or what will happen if they do not respect your boundary. Follow through on the consequence if they violate your boundary again. Be clear and firm, especially with people who don’t have very good boundaries themselves. Schedule proactive “meetings” to discuss your boundaries. Be firm but polite, and strive to have a natural discussion that involves natural give and take on both sides. This is a way that leads to compassion! This structure offers safety to both parties and allows everyone to leave feeling understood and respected. Give explanations that are specific and relevant to the other person. This will not only decrease confusion but also increase the likelihood of success. Try not to place blame on either side and focus on moving forward together to find shared solutions. Perhaps find a compromise you can both agree to. When setting a boundary, you must be willing to accept that you may not get what you want/need. Be willing to let go of the outcome. In sharing a boundary, you have shared what is true for you and honored your values and priorities. It is then up to the other person whether or not to abide by it. This proactive boundary setting can support your ability to identify when the boundary is crossed and avoid you and others having an expectation that will always be able to step-up to help a co-worker. Although establishing boundaries can be a challenging process, it is also empowering. If you’re still having a tough time mastering CR, don’t worry. CR is a process that requires constant maintenance and happens over time. Keep at it. Incorporating the above tips into your routine will help prevent and lessen compassion fatigue. We’ll be discussing self-care in November’s post as we continue our series on building CR. Be sure to check in then for more information. In the meantime, sign up for the WISE newsletter, attend a WISE meeting to get more involved, or visit our website at https://wisewisconsin.org/.